Glenn Beck has been promoting the tea party movement ever since it arose upon the America scene, but what are the various elements of the folks who identify themselves as "tea party?" What is the tea party for, and what is it against? Is it a real grass-roots phenomenon, or is it lead by right-wing operatives with their own agenda? It is difficult if not impossible to characterize the tea party as a whole because of it's own diversity. Some of the people in the tea party are long time Libertarians who should have been as upset with President George Bush's big government programs and huge deficits as they are with President Obama's big government programs and huge deficits. That they were not protesting during the Bush Administration is indicative that there is more to their ire than just spending and deficits. The national debt was $10.626 trillion when Obama took office. Not wanting to increase taxes and needing to stimulate the economy in a severe recession, the President has added over $3 trillion in tax cuts and spending to the national debt. The debt is an all-time high of $13.7 trillion and rising rapidly. 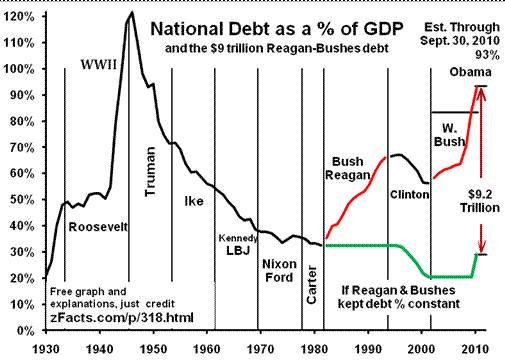 The chart by Z-facts also shows what Presidents Reagan and Bush added to the debt ($9.2 trillion). An article on Z-facts, "We are in danger but not from the debt," is well worth reading for anyone alarmed at the rapidly growing national debt. In short, the sky is not falling. We have been through this before, and we will turn this problem around again. Electing candidates that want to keep taxes low for those making over $250,000/year will not help turn the debt around. Libertarians and their wealthy benefactor will be around long after the tea party movement is a footnote in history. A month or two ago, Beck announced that the debt had reached 100% of GDP. That was just one of a long list of fibs, lies, false claims, misleading statements, etc. that Beck uses in his entertainment schtick and 12-step program to yesteryear. Beck's new book, Broke, is nothing new in American history. Since FDR, reactionaries have tried to scare people during downturns in the economy. Another segment of the tea party are cultural warriors. These are social conservatives who would be active opposing any Democrat that occupies the White House because that's what they do. With Beck's turn this year toward that old time religion and further away from the pro-choice views of his pony tail years, he has become a culture warrior. In short these people want the U.S. to be a Christian nation, not one with a clear division between church and state. The purpose of Beck's and David Barton's Black Robe Republican Regiment is to get out the vote of those fundamentalist and evangelical Christians who place belief above science for solving problems and want to run the country according to the Bible whatever that means. There is nothing new about these folks either. They would be upset about any pro-choice Democrat. Their poster child is the professional candidate Christine, "I am not a witch" O'Donnell. These are people who would gladly tear down the wall of separation that exists between church and state. Reactionary Christians like Barton and O'Donnell will be around long after the tea party is all but forgotten. A third section of the tea party movement are the people who are angry at how poorly the economy is performing and at the government bailing out Wall St. fat cats but not Main Street folks. It doesn't help that Beck rails against "Obama's" bailouts. However when TARP, the troubled assets relief program, was passed, George Bush was the President. Because of Obama's handling of this program, all but $100 billion of the $700 billion has been paid back to the federal government with interest. AIG, the mega-corporation that owes the remainder of this bailout, will pay what they owe after they recover their footing. This segment of the tea party really began with Rick Santelli's rant on the floor of the Chicago Mercantile Exchange on February 19th, 2009. He was upset with a federal program aimed to slow the crashing housing market that is still dragging the economy down to this day. He didn't think it was right to bail out people who bought too much house for their income, but that was not the purpose of the program. The crippled housing market is still a serious drag on economic recovery. Many of these people are angry that the economy was failing, is not bouncing right back and may take a long time. These middle and working class people have misplaced anger. The unregulated mortgage industry and their sub-prime mortgage scam brought this economy to its knees, not the government. The Santelli segment of the tea party will tend to latch on to whatever political movement that seems to be positioned to direct their anger when times get tough and life seems more unfair than it usually is. Unlike the rest of this movement, they are more confused than they are reactionary. These are the folks in greatest need of reminding that the Boston Tea Party was every bit as much a rebellion against the East India Tea Company as is was against our British overlords. 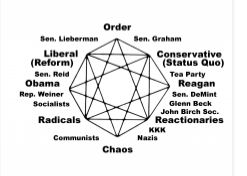 In the mandala below, they are displayed above "Reagan" on the right; but the bulk of the tea party and its candidates for national office seem to reside in the lower, right quadrant of this political taxonomy, in the area occupied by extremists Jim DeMint and Glenn Beck. The bottom half of this symbol is out of the American mainstream and the core of the backlash against President Obama. There is a fourth "corner" of the tea party movement that people in positions of authority, to their credit, are purging from their ranks. These are the racists. 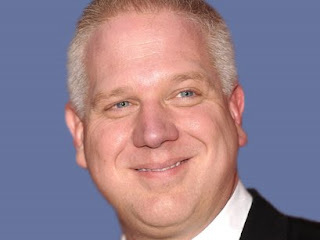 It is a hopeful sign for progress in race relations and national unity when the far right political movement and their media cheerleader, Glenn Beck, are overtly and strongly against racism and willing to embrace the few members of minorities who think, for whatever reason, that the Tea Party is something to participate in. In Beck's case, his anti-racist rhetoric would go a lot further toward healing racial divides if he would stop using the President's race as another reason to oppose him. These four categories are not rigid divides. There may by racists in any of the first three categories of tea party types, but there is reason to suspect that there are fewest racists in the Libertarian corner of the movement. With his un-Christian race-baiting, Mr. Beck stirs fears nervous middle class whites may have about a changing America demographic. This brings up a fifth section of the tea party which is most racist, the anti-immigration nativists. Despite the facts of reduced illegal immigration, fewer crimes committed by illegal immigrants in recent years and increased deportation efforts on the part of the federal government under Obama, these nativists are behind and/or supportive of AZ's "papers please" law. Nativists have been around since early in this Republic and will likely be around long after the tea party is forgotten. The following is a list of articles about the tea party movement. If you take the time to read them all, you will have an excellent grasp of this interesting and diverse movement aiming to "take the country back" to some point in the past. How much the tea party candidates want to reverse the protections enacted by the federal government for the people that have been established by progressive politicians over the last 100 years is probably as diverse a range as is their movement. Clearly, if Glenn Beck, their inspiration and number one guide, has his way, the United States would look like a contemporary hell scape of the corporate monopoly controlled government that we had in the later half of the 19th Century. (For an entertaining video that describes this possibility, click on this sentence. Attaching to Facebook makes it awesome.) This is straight forward: Beck is a shill for the corporate fat cats. The tea party itself is backed by the far right, pro-corporate, anti-environment oligarchs. Their primary funders seek a government of the rich, by the rich and for the rich; and the tea party would lead the country to full blown, unopposed plutocracy. The stakes in this election are very high: vote wisely. "Tea/GOP Party would HATE our actual founders"
"When Tea Party want to go back, where is it to?" "Tea Party Leaders are Not Anti-Establishment"
"Karl Rove says tea party "is not sophisticated" during German interview"
"Tea Party: Old Whine in New Bottles"
"How do you take your tea?" "Christine O'Donnell's misconceptions of the Constitution"
"Is the Tea Party movement like a pyramid scheme?" "SarahPAC Candidate 'Should Be in Jail'"
"The Tea Party All Stars: The Worse of the Extreme GOP Midterm Candidates"
"Get the anti-science bent out of politics"
There's little doubt that the reactionary and conservative audiences of FoxPAC, Rush Limbaugh and Michael Savage will be supporting these reactionary, pro-corporate tea party candidates. They have great enthusiasm in wanting to stop the President from dealing effectively with national issues like immigration reform and energy independence, both national security imperatives. Crazy-Con Glenn Beck's 9-12ers are, no doubt, very active getting his reactionary message out, and all of America's militia families will be sure to vote for these politicians of yesteryear. If the reader has gotten this far still undecided about whether or not to vote for a tea party candidate, then check out "One Possible Closing Argument" by Simon Rosenburg. In it he conveys the perspective of this Review: "The stakes this fall are high. America faces grave economic and geopolitical challenges. One party is attempting to face these challenges head on, has overcome extraordinary opposition to do big things these past few years, and needs more time to ensure its forward-looking and modern plan for the American economy succeeds. The other party is disappointingly offering nothing more than disproven and discredited political bromides, is retreating further into ideological crazyville, and is simply not ready or capable of doing what is required to ensure our future prosperity." Know any undecided voters? Get involved.